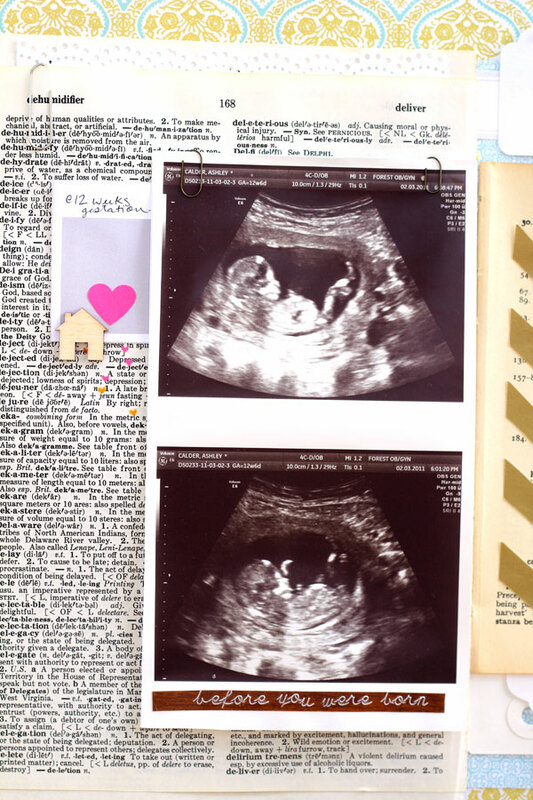 A page with Lady Bon-Bon 12 hours after birth, and at about 12 weeks gestation. 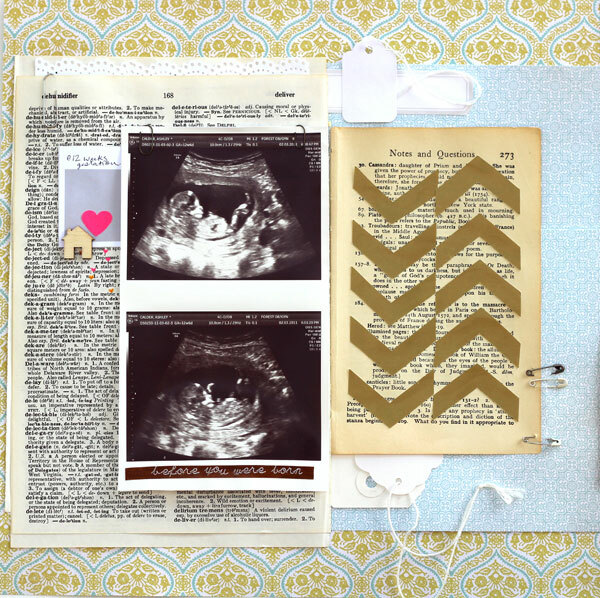 I am sure no matter how many children you have, seeing them on ultrasound before they are born never stops being an absolutely incredible experience. I truly cherish these photos. Lots and lots of Studio Calico on this one! I really enjoy doing these mismatched background double page layouts. I guess it is not too different than the way a lot of scrapbookers make sure their facing single pages co-ordinate, but with only one title and journalling for both pages. I find using the two different backgrounds much less daunting than trying to fill up a background of all one colour or pattern. Plus, I so rarely buy two sheets of the same patterned paper! 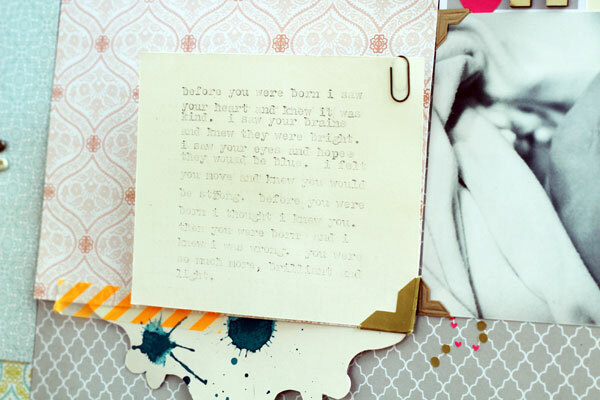 I love this pretty damask paper -- it is the B side of Spreadsheet from the Take Note collection. 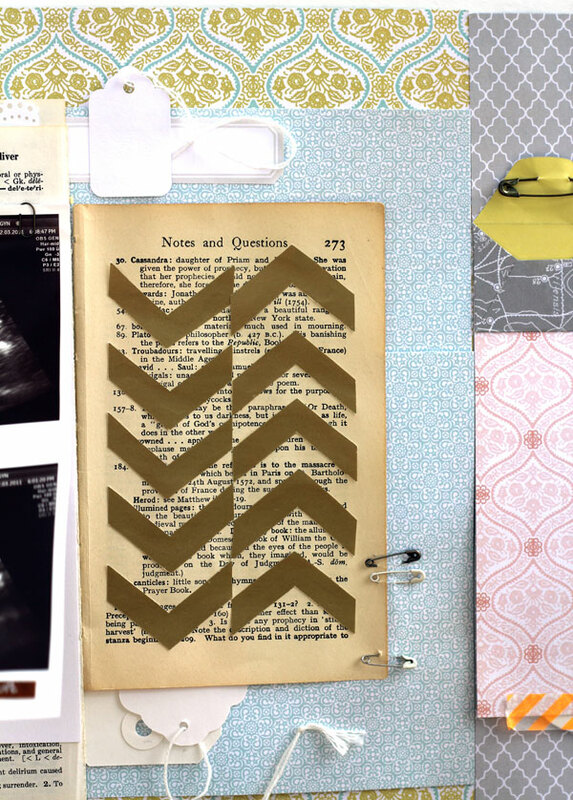 The delicate blue paper under the gold chevron book page is actually two 6x6 papers layered together, from the Autumn Press collection. This is such a great way to add that perfect colour and size of print to your page when you need a piece larger than 6x6. I swear, I would love it if the companies came out with 12x12 sheets of the patterns in the reduced sizes of the 6x6 pads! For the gold chevrons, I cut some chevrons out of some old gold paper (that I got in the 8th grade!!) and adhered over an old book page. 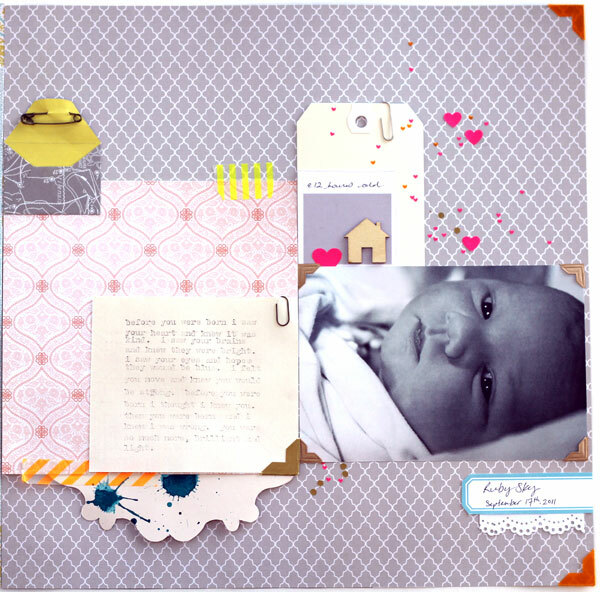 The right side of the layout has Wag patterened paper from the Classic Calico collection as the background. That pretty pink damask is also from the 6x6 Autumn Press pad. These little 6x6 papers are so great for just using as a block and are such a perfect proportion for using alongside a 4x6 photo. I always try to incorporate the same, or similar, elements on both sides of a double page layout. Here the pink damask paper is the same pattern, but a different colourway and size as the damask background paper. Along with using the same wood veneer houses, neon pink hearts, safety pins in varying sizes and photo corners on both pages, the similar patterned papers help unify and unite both pages. 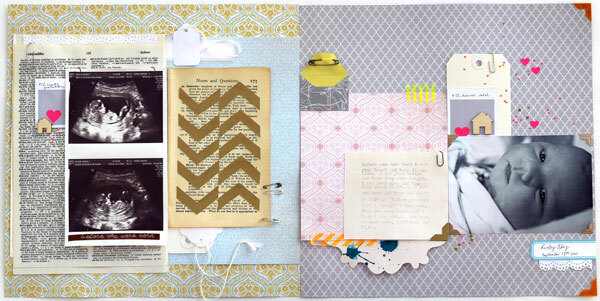 This approach is also great for using in a mini album to make the whole project feel cohesive. I don't usually try to match the words on the book pages or dictionary pages to the theme of the paper, but I was happy to see I had chosen a page from the dictionary that said deliver at the top. How appropriate! I love using those little wood veneer houses from Studio Calico on any page that reminds me of home or family. I punched out hearts (and tiny hearts!) from neon pink paper and neon orange vellum and sprinkled a few around here, and on the right hand side page, too. Typed journalling. And gold confetti and neon pink hearts. The scalloped tag is a *vintage* Foofala tag, plain backside turned forward. I splattered it for another project and didn't end up using it, so put it in my scrap pile. Things that don't work out aren't always mistakes -- sometimes they are just supplies for a future project! 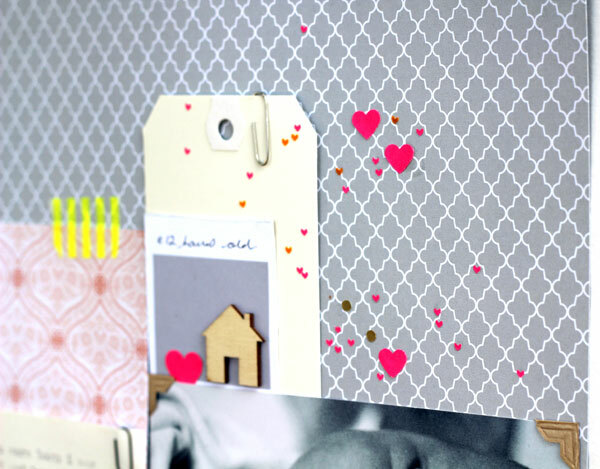 I love the way that neon orange Heidi Swapp tape pops against the pale pink patterned paper and neutral grey background! fab, as always. love the pops of neon.